Scooper - Technology News: Which are the world's biggest religions? 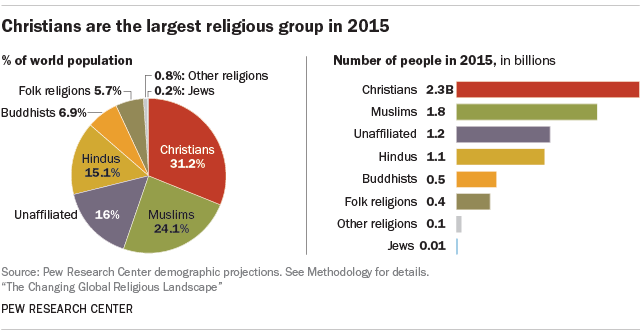 Christians remained the largest religious group in the world in 2015, making up nearly a third (31%) of Earth’s 7.3 billion people, according to a new Pew Research Center demographic analysis . But the report also shows that the number of Christians in what many consider the religion’s heartland, the continent of Europe, is in decline. Indeed, fertility differences between religious groups are one of the key factors behind current population trends and will be important for future growth. Globally, Muslims have the highest fertility rate of any religious group – an average of 2.9 children per woman, well above replacement level (2.1), the minimum typically needed to maintain a stable population. This fertility advantage is one reason why Muslims are expected to catch up with Christians in absolute number and as a share of the global population in the coming decades . Christians have the second highest fertility rate, at 2.6 children per woman. Hindu and Jewish fertility (2.3 each) are both just below the global average of 2.4 children per woman. All other major religious groups have fertility levels too low to sustain their populations.